Ajoene, allicin, aliin, allixin, allyl mercaptan, allyl methyl trisulfinate, allyl methyl trisulfide, allyl propyl disulfide, diallyl disulfide, diallyl hepta sulfide, diallyl hexa sulfide, diallyl penta sulfide, diallyl sulfide, diallyl tetra sulfide, diallyl tri sulfide, dimethyl disulphide, dimethyl trisulfide, dirpopyl disulphide, methyl ajoene, methyl allyl thiosulfinate, propylene sulfide, 2-vinyl-4H-1, 3-tithiin, 3-vinyl-4H1, 2dithiin, S-allylcycteine sulfoxide, cysteine PLUS over 35 other constituents whose actions are unkown. Garlic contains 17 aminoacids and their glycosides, arginine and others. Minerals such as selenium and enzymes like allinase, myrosinase, peroxidase. Isn't it impressive? Let's dig a little bit deeper and look at the science behind this intriguing plant. It comes out that the sulfur compounds of garlic are responsible for both medicinal effects and pungent odour. The odour is formed by the enzyme allinase on the sulfur compound called alliin. This enzyme is inactivated by heat, so cooked garlic odour is nowhere as strong as the raw garlic odour and as such much less physiological benefits. Aliicin, one of the most active compound does not exist in garlic unless garlic it's crushed; crushing the garlic clove activates the enzyme allinase that metabolizes alliin to allicin. Allicin is further metabolized to vinyldithiines. This breakdown occurs within hours at room temperature and within minutes during cooking. Allicin has antimicrobial effect against many bacteria, funcgi, parasites, viruses. Ajoene is a garlic derived compound with greater chemical stability than aliicin. Several clinical studies and in vitro have demostrated anti-thromosis, anti-microbial and cholesterol lowering activities. Topic application has produced significant clinical response in patients with skin basal cell carcinoma. Ajoene was shown to inhibit proliferation and induced apoptosis of several leukemia CD34-negative cells. Ajoenes and dithiins are the most active compound of fresh garlic. Ajoenes have been shown to posses anti-clotting activity in the lab. It displays significant antifungal activity, inhibiting the growth of Aspergillus niger, Candida albicans, Paracoccidioides-Brasiliensis and Fusarium species. Study from University of Minnesota, found that ajoene is a potent as aspirin in preventing sticky red blood platelets from clumping together. Related factors lenghten clotting times, while others actually disolve clots. All three effects can impact on heart attack and stroke prevention. S-allycysteine and S-allymercapto-L-cysteine had the highest radical scavenging activity. Some organosulfur compounds derived from garlic, have been found to retard the growth of chemically induced tumors. 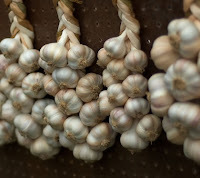 A 2006 study in the "Jurnal of Nutrition" found that garlic supplements can help treat Helicobacter Pylori, a bacteria that can cause gastric ulcer. Garlic as a herbal medicine has anti inflamatory and immuno modulatory properties that have been extensively demonstrated in vitro and in vivo in animal models. Dr. Artturi Virtanen, a Nobel Prize winner for chemistry, proved garlic’s prolonged action against dysentery and typhus, as well as other infections caused by streptococcus and staphylococcus. Since scientists estimate that within ten years antibiotics will become redundant according to BBC, adding garlic to your everyday meals seams to be a good idea http://www.bbc.com/news/health-30416844 . You don't like the smell, go for garlic capsules. Problem fixed. Shobi, N. (2015). GC-MS CHARACTERIZATION OF ORGANIC SULPHUR COMPOUNDS AND OTHER VOLATILE ODOROUS COMPOUNDS FROM ALLIUM SATIVUM. Asian Journal Of Microbiology, Biotechnology And Environmental Sciences, 17(Special issues), 73-78.